Each of us can identify words that either bug or baffle us. We sometimes fall into the trap of thinking that the grammar or spell check feature on our computer will get us off the hook—or out of the hornet’s nest. Not so. 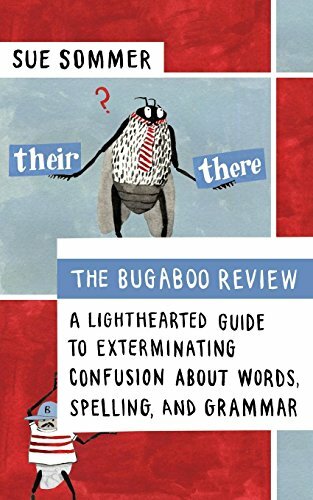 This book is “A lighthearted examination of usage, grammar, and spelling mistakes”—the bugaboos of the English language. In her early career, high-school English teacher Sue Sommer began keeping a running list of frequently misspelled words and grammar gaffes—all too common in this world of texting, television repartée, and email. Soon, colleagues and students suggested additions of words that “bugged” them. The loosely assembled collection grew and grew, ultimately becoming The Bugaboo Review, a book that is used as a reference by students during their high-school years, and then carried on to college. Parents request copies for their use as well. Now we can all benefit from this labor of love (and love of language). The book starts with “bugs that really bite.” For this section Ms. Sommer chose an “infestation of errors” that make her want to cringe. Memory aides provide ways to “exterminate” them. Graphic insets summarize main points, which is good for quick reference. There is also some commentary on how language changes over generations—a process which is accelerating in the digital world. The bug theme is used throughout and deftly defuses the dryness of the subject. Blessedly missing are the rules that govern spelling and grammar. These are often complicated and confusing, causing students to retreat to familiar lingo. The author’s true pet peeves are listed in alphabetical order. Included is a litany of misused words, such as anyways and nowheres Compound subjects, such as him and I (as in him and I went), or her and I (as in her and I talked), are followed by advice on how to remember the correct usage. Here, she advises students to remove or block out one of the subjects and hear how the sentence sounds, i.e. him went, her talked (corrected to he went, or she talked). The “Body of the Bug” Section (some students call it the “thorax”) includes words with tricky spellings, and incorrect phrases. The author offers her own counsel “to help you navigate around the hornet’s nest that is the English language!” Found here are phrases like all the farther or all the faster, and the ubiquitous alls—which is not a word at all. Some words and phrases belong in only one place: the “Roach Motel.” In other words, “Don’t Go There!” Included here are: could of; inside of (corrected to could have, and inside). Others are destined for the Bug Zapper: boughten, orientate, how about we, is when, off of (as in I borrowed this off of) or whole nother. A list of “final stingers” or words that are frequently misspelled completes the text. Ms. Sommer’s reference book is both time and student tested. It is also intended to both assist and amuse. These factors make the work unique among similar manuals currently on the market. Some readers might occasionally disagree with the author’s judgment about usage—a point that she concedes. Modern usage changes what is acceptable from year to year. Nevertheless, this is the kind of book a teacher would be pleased to see with dog-eared corners, marginal notes, and mustard stains. Diane Brandley is a newspaper columnist, magazine contributor, and book reviewer.